ARAWC Executive Director Richard Evans and his team are clearly enthusiastic about opt-outs and their potential to form a grassroots movement in the employer community, but the organization itself is relatively new. “The group got started late last year  as a coordinated effort, instead of just creating state chapter after state chapter,” said Evans. He explained further that ARAWC was not a tough sell for large employers already operating in Texas and non-subscribing. These employers, and others in neighboring Oklahoma, will likely opt-out again in Oklahoma now that it has an “Option.” Although ARAWC was not directly involved with the Oklahoma “Option” that passed last year, ARAWC encouraged the measure and worked with stakeholders in Oklahoma, including its member employers. Membership in ARAWC seems to prove the national interest that Evans cited in our interview. Founding and full members include such well-known names as Wal-Mart, Best Buy, Nordstrom, Macy’s, Safeway and Sedgwick. ARAWC’s ranks also include top industry experts who develop and administer individual “Option” plans. Membership is open to any employer or association that desires to see ARAWC’s brand of “Option” available in other states. Although Evans did not share the specifics of Edwards’ criteria, he emphasized that both general interest, and performance of each state’s workers’ compensation system, must be aligned so that legislators will be willing to consider an “Option” for employers in their state. “We’re looking at states that have high workers’ comp costs and looking at what the cost drivers are…and we’re also interested in our ARAWC members and where they have operations,” Evans explained. As for what the legislation looks like, Evans is a proponent of individualized solutions. ARAWC, though based in Texas, states in its frequently asked questions page that it has developed “model legislation” that provides a framework for what factors states should consider when crafting an “Option,” but that they serve only as a facilitator for “Option” design discussions – helping to educate legislators and stakeholders about how an “Option” can work, and providing resources to advocate for state-specific legislation. According to Evans, Louisiana is “not on the shortlist” for states that ARAWC is considering. 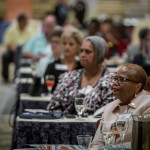 He explained: “Louisiana might fall into that [high workers’ comp costs] category…but when we get to some of the other criteria, it’s not there.” However, given the list of prospects for the next two legislative sessions, if successful, Evans and his team at ARAWC will create a compelling situation for Louisiana. We are adjacent to “Option”-friendly Texas and Oklahoma already and would then be nearly alone in the region (minus Mississippi and Arkansas) if Alabama, Georgia, Tennessee and Florida were to pass opt-out legislation. While the benefits for business in terms of lowering workers’ comp costs are generally established, the well-being of the employee population in states with an opt-out is not necessarily clear. 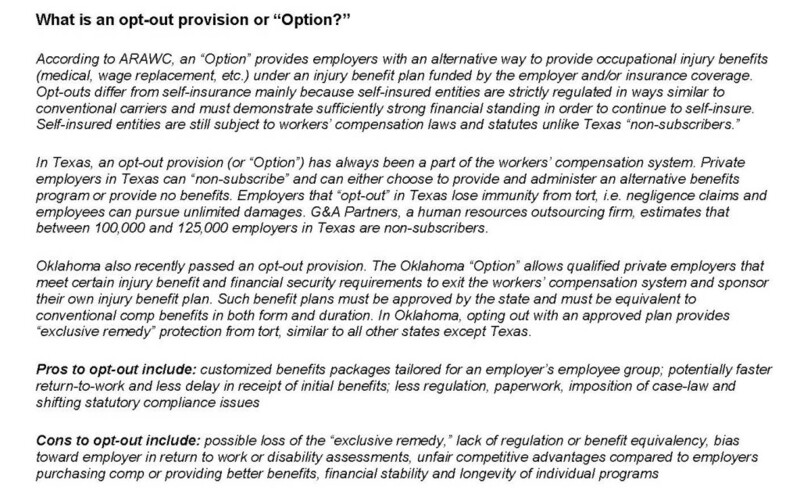 This is perhaps why Evans does not emphasize a Texas-style opt-out as every state’s “Option” starting point. In Texas, employers that choose not to subscribe and purchase workers’ comp coverage also do not have to provide replacement or equivalent benefits, they simply lose their immunity from tort or negligence liability. By contrast, Oklahoma’s “Option,” also supported by ARAWC and its powerful members, is only available to private employers, and preserves an employer’s tort immunity, with the stipulation that each employer’s “Option” plan provide equivalent benefits to conventional workers’ comp coverage in the state. As of late September 2014, only nine employer “Option” programs in Oklahoma have met state equivalency standards and been approved. Employee Care Under an “Option:” Is it Comparable?